I am happy to announce a new Language Cultural Immersion Tour in Matera with the Studentessa Matta. In September 2013: 14th – 21st we will travel to la Basilicata where we will be immersed in the culture of Matera, while expanding our Italian language skills! 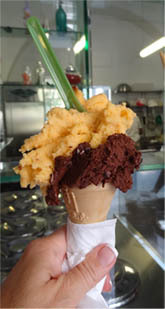 The 2013 “Studentessa Matta” Matera/Basilicata Tour is a custom designed experience in the south of Italy, in the heart of the Basilicata. This language and cultural immersion tour will give each participant a unique opportunity to explore Matera and the “Sassi” with experienced teachers and guides. The tour is ideal for both beginners who want to embark on learning Italian while exploring the charms of la Basilicata, as well as for advanced language learners who want to deepen their understanding of the language & polish their conversation skills in a warm and friendly environment. Ilaria Navarra of Percorso in Italy, has invited me to facilitate a language immersion experience in her home town of Matera. Ilaria is dedicated to her job and has a great passion for her Paese. During the 2013 Language Retreat in Matera, Ilaria will act as coordinator and with experienced Italian teachers will lead morning Italian classes and seminars. During the afternoons we will continue practicing the language while being treated to a new cultural activity every day. We will be cooking, wine tasting, sampling local cheeses and gelato, learning about Matera’s fascinating historical past, interacting with the locals, as well as living & enjoying the life style of the Basilicata at our own pace, during several free afternoons or evenings. Accommodations for single and double occupancy rooms will be arranged at Le Monacell or, in nearby B&Bs that are within walking distance of our school. Deposit: A 60 Day Refundable Deposit of $300 per person is required to confirm enrollment. Or, you may pay the entire tour price when you make your booking. (*After 60 days the deposit will no longer be refundable). To book your tour please contact Melissa at: melissa@studentessamatta.com for details. To get to Matera, the closest airport is Bari – Palese “Karol Wojtyla”. In just 40 minutes you will be in the city of the Sassi. You can book a transfer from the airport to Matera city directly with us through our partner FERULA VIAGGI. Check out our new Google Map! Choose & book your accommodations from our map. All room prices are included in the price of the tour. • 7 Days Accommodation in the heart of Matera at local B&Bs within walking distance of the school. See our google app above to select your accommodation. **For lunches and evening meals not detailed above, we have arrangements with 2 local restaurants were participants may eat at a reduced fixed rate. Saturday September 14: Participants arrive in Matera and settle into their rooms at “Le Monacelle”, or at a local B&B, situated amongst the hundreds of dwellings and churches dug out of the rock in the SASSI DISTRICT also known as Old Town. Meet Melissa & Ilaria and share a welcome glass of wine! • Beginning at 4pm Ceramica & Cartapesta: students will be instructed by local artisans of ceramic & cartapesta. For the students who are interested, there will also be a chance to create a small object by themselves, under the guidance of a local artisan. • 9:00 am – 12:00 pm: Italian lesson (Outdoor). Visiting the markets of Old town: students will be divided into small groups & each will be presented with a task to accomplish – students will work together to speak & interact with locals. • Beginning at 4pm Gravina Walking Tour – a walk through the scenic area of Murgia Timone in front of Sassi, discovering the most spectacular rock landscapes with carved out cave-churches enriched with frescos. Saturday September 21: Arrivederci! Ci sentiamo! 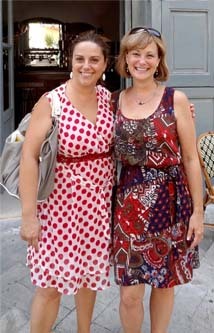 Join Ilaria and Melissa in Matera in April 2013 for an amazing language immersion experience! Ci vediamo a Matera – la città dei Sassi! Melissa will provide assistance with all reservations.